Clarissa Delaney is excited about starting Grade Seven. She was going to have the teacher she wanted for a number of years, her life with her mom made her happy and she enjoyed spending with with her best friend Benji. Little did she realize how much her life would change over the course of Grade Seven…. Throughout the year, Clarissa has to deal with a number of different issues. Her dream teacher leaves the school and she detests the teacher who comes in as a replacement. Her best friend Benji is bullied for being different by some nasty boys at school. And Clarissa has to face the biggest change in her young life when she finds out that her mother has cancer. During the first part of the book, I found myself wondering if I had chosen a book that was simply too “young” for me to relate to – I liked the characters but I didn’t find myself engaged in the story. As the novel progressed, however, it began to take on another dimension as Clarissa struggles with trying to deal with the anger she feels as her best friend is constantly belittled and bullied and her mother (who is her only parent) reveals that she has been diagnosed with breast cancer. The maturity in Clarissa’s character is obvious as she faces these issues and deals with each one. By the end of the novel, I was glad that I had taken the time to read it because it is one that I will happily share with the tweens I know. 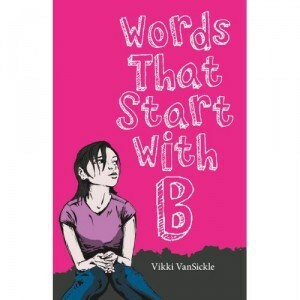 I think Words that Start with B has a depth to it that allows it to be appreciated by tweens, teens and adults alike.